Sudan is an incredibly complex country. Wars and coups have marked its history since it gained independence in 1956. The country is littered with killing fields, some localized and some with national and regional implications. Perhaps no area is more volatile and carries more implications for Sudan’s future than the oil rich region of Abyei—Sudan’s “Kashmir”—astride the boundary between North and South roughly 500 miles southwest of Khartoum. There lies one of the most potent of tripwires in all of Sudan. If the political crisis regarding Abyei is addressed, there is potential for peace in the entire country. If it is mishandled, it dramatically increases the possibility that Sudan’s current conflicts—from Darfur to the South to the East—will explode over the coming few years into a national war with regional implications and historically devastating repercussions for its people. In our last strategy paper, we outlined the reasons why Darfur and Southern Sudan were linked and argued that a prerequisite for peace in Darfur is the faithful implementation of the Comprehensive Peace Agreement, or CPA, which in January 2005 ended the 20-year-long most recent phase of war between North and South. We discussed the reasons why the Sudan People’s Liberation Movement, or SPLM, had suspended its participation in the Government of National Unity, or GNU, created by the CPA. On December 21, 2007, after two and a half months of tough negotiations, the SPLM announced that it would return to the GNU, suggesting an agreement had been reached on all the issues except for those CPA provisions related to Abyei. The ruling National Congress Party’s, or NCP, non-implementation of its commitments on Abyei and other elements of the CPA is part of a pattern of obstruction that is at the core of its governing strategy and is linked closely to its obstruction of the UN-AU Darfur force, or UNAMID, and other Darfur agreements. However, in the past, when there have been meaningful consequences for such actions, the NCP has changed course. But if there continue to be no costs for the NCP’s efforts to undermine peace and security in Darfur and the South, then the cycles of violence will continue. The only chance for peace in Sudan will come if the United States, France, and Britain, backed by strong support from the region, work together to overcome China’s and Russia’s objections at the UN Security Council and impose a real cost for this pattern of obstruction. President Bush must take a leadership role in imposing that cost—in the form of UN Security Council sanctions, U.S.-EU cooperative pressure and provision of comprehensive information to the International Criminal Court—in support of CPA implementation, UNAMID deployment, and peacemaking in Darfur. Furthermore, President Bush and the UN Security Council need to publicly and privately state that the Abyei Boundary Commission determination is the “final and binding” demarcation of the border for Abyei, and that the NCP is obligated to accept this. The silence from Washington on this issue is deafening. It is a legacy issue for the Bush administration, given its level of engagement on Sudan over the last seven years. On Abyei specifically, it is an issue of honor and duty, given that the United States directly negotiated the Abyei Protocol which helped nail the CPA deal. Abyei repeatedly surfaces as a key factor in Sudan’s North-South struggle. Why is Abyei so key to peace in Sudan and what does its experience since independence demonstrate about the value of an agreement with Khartoum for the people of peripheral regions of Sudan such as Darfur, the South, the Nuba Mountains, and the East? Abyei is very near the border of what is now South Darfur. Historically, Abyei was unique, having developed a reputation as a bridge between North and South Sudan, especially during the later British colonial period. This is because it was an enclave of perhaps 280,000 non-Arab Southerners who had adopted some Arabic cultural practices. The group was living within Kordofan, a northern state thoroughly dominated by Sudanese Arabs. That linkage dynamic persisted for decades despite periodic egregious pogroms by Baggara Arab militia and local government security forces, but began to change dramatically after independence. This is because, from that point until today, Khartoum, though the national capital, has functioned as a partisan Sudanese Arab capital, with most other Sudanese non-Arab populations politically marginalized and effectively powerless. As Southern nationalism grew, particularly as a result of the first phase of the North-South civil war (1956-73), the identity of the Ngok Dinka of Abyei as Southerners surged. The participation of many Dinka from Abyei in that first Southern war positioned many of them to assume leadership positions in the second Southern war, which began in 1983 led by Dr. John Garang. The first North-South war ended in 1972 with the Addis Ababa Agreement in which the South won regional autonomy, which was later abrogated, and Abyei won a referendum promising its population the free choice either to remain in Kordofan or to be integrated into South Sudan. But that referendum was never held. Khartoum’s pattern of signing agreements with adversaries and then failing to implement them is well established in the South—going back at least three governments—and now more recently in Darfur. Until there is a wider sharing of power and more democratic and transparent decision making in Sudan, it is likely no agreement providing for meaningful change will be honored. The “second” North-South war, which lasted 20 years, resulted in more than 2 million civilian deaths, the displacement of more than 4 million others, and virtually the total destruction of the South, the Nuba Mountains, Southern Blue Nile and Abyei. In fact Abyei became essentially uninhabited; it ceased to exist except in the hearts and minds of the surviving Ngok Dinka, scattered to the four winds, and, of course, oil entrepreneurs. Today, Abyei remains tense. According to the International Crisis Group, Abyei’s oil fields grossed roughly $670 million for Sudan in 2006, approximately 13 per cent of the country’s total income from oil exports that year. While oil in the area is reportedly being extracted hurriedly and depleted rapidly through aggressive exploitation and oil revenues from Abyei beyond 2007 are estimated to drop significantly, revenue from Abyei’s existing fields remains a critical priority for the NCP. As President George W. Bush’s administration took up the reins of government in Washington D.C. in January 2001, it was clear early on that the United States was considering an initiative to end the war in Sudan. After initial actions to test the openness of the government and rebels to a U.S. initiative, the president on September 5, 2001, appointed former Senator Jack Danforth (R-MO) as his Sudan peace envoy. Danforth led a well-staffed U.S. team which—in collaboration with strong leadership from Kenya and the regional Intergovernmental Authority on Development, or IGAD, the United Kingdom, Norway, and others—supported, cajoled, and pressured the Sudan government and the SPLM (hereinafter “the Parties”) through an incredibly complex negotiation which ultimately produced the CPA. The Parties themselves negotiated acceptable, detailed language on a wide range of issues. There was one exception: Abyei. The heated disagreement between the Parties over Abyei became the potential undoing of the entire CPA negotiation process. Determined not to let the talks unravel, the United States decided that it would draft the text of an Abyei agreement and pressure the two sides to sign. The U.S.-drafted text was presented to the Parties at a hotel in Naivasha, Kenya in March 2004. The SPLM accepted the text on the day it was presented; the reluctant GOS did so subsequently. • A referendum in 2011, simultaneous with the South’s referendum, to determine if Abyei will thereafter be part of the North or the South. Despite its critical role in brokering the deal, the U.S. government has been largely missing in action in terms of facilitating and pushing for faithful implementation of the Abyei Protocol during this entire two and a half year period. The Abyei population that was displaced by the war has begun to return, despite the uncertainties created by President Bashir’s rejection of the Commission’s findings and the lack of U.S. and international interest. Its current population is around 75,000, a quarter of its former population, and is slowly growing. Despite their best efforts and those of the United Nations and the NGOs that are assisting them, life in Abyei is very basic and peace very fragile. The NCP’S approach is a key factor in the tensions between the SPLM and the NCP and how the Parties function in the GNU. Its rejection of the ABC report has rendered inoperative the entire Abyei Protocol and established the precedent that one party to the CPA can abrogate CPA provisions without public criticism or penalty from the United States or the broader international community. It is widely understood that this precedent, if not redressed, may hold serious implications for nationwide elections scheduled for 2009. Furthermore, by rejecting the Abyei Protocol, the NCP has essentially nullified the Abyei referendum scheduled for 2011, raising the threat of violence. If the NCP ultimately decides to abort the CPA, the Abyei issue is the most likely justification it will use. Its strategy appears to be to blame the Americans for the Abyei Protocol, blame the British and Americans for the ABC, and bait the SPLA into firing first by doing nothing on Abyei until the fighting starts. Others suggest that Bashir’s actions will force the SPLM to declare independence unilaterally and prematurely, with unknowable consequences. The NCP’s approach has perpetuated and aggravated tensions between the military forces present in Abyei. As a consequence of the non-implementation of the Abyei Protocol, the situation on the ground remains unstable. Several confrontations between the SPLA and Sudan Armed Forces have occurred. In such an event in the prevailing atmosphere, it may not be intentional hostilities that are the threat but rather accidental ones. The good news is that the recent agreement ending the SPLM’s suspension of its participation in the Government of National Unity included a number of helpful commitments, including the integration of some forces from both sides into a Joint Integrated Unit, or JIU, that will be the principal security force in the area, as well as an agreement to pull back the Parties’ own forces out of Abyei . The NCP’s actions have destabilized relations with the Ngok Dinka’s northern Arab neighbors, the Misseriya. The Misseriya have important vested interests in the implementation of the Abyei Protocol, as it guarantees them critical grazing access for their animals to Ngok Dinka lands in Abyei, even if Abyei, pursuant to the CPA-mandated referenda, becomes part of an independent South Sudan in 2011. Although significant numbers of Misseriya have become dissatisfied with various NCP policies and many have recently joined the SPLM and even the SPLA, significant violence between Misseriya and the SPLM occurred in the last week of December. Bashir’s approach has slowed the return of Abyei’s displaced and refugee population. It takes a hardy soul to move from a relatively secure situation, say in Juba or in a U.N. refugee camp in Kenya, into Abyei‘s current instability. And, too, the quality of life remains extremely difficult. Economic life and public services are minimal. Because of Bashir’s abrogation of the Abyei Protocol, the local government provided for in the Protocol has never been set up. And the 2 percent of oil revenues generated from product extracted from the Abyei area remain unavailable to actually be used to improve public services in Abyei, further heightening tensions. Although Khartoum’s oil procedures are thoroughly opaque, if reports that the NCP is in a rush to essentially drain those oil deposits geographically subject to the Abyei Protocol are accurate, this could negatively shape Abyei’s economic situation well into the future. Furthermore, the Darfur rebel groups severely question why they should enter into peace negotiations with the NCP, whose track record of abiding by negotiated agreements, whether on Darfur itself or the South, has been thoroughly negative. 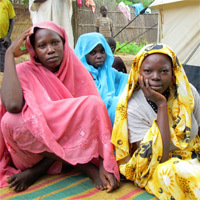 Although they have many examples from their own experiences in Darfur, Bashir has made Abyei the proof of their fears. One way the United States and international community could encourage the Darfur rebels to negotiate seriously is if these external actors with leverage took seriously the violations of the Abyei Protocol. The non-resolution of Abyei and the lack of interest demonstrated by the key international partners—especially the United States—means that the threat of Abyei unraveling remains a dagger pointed at the hopes of peace in Sudan. 1. Defining a U.S. legacy: President Bush should view proper implementation of the CPA as a legacy issue, and Abyei is the provision of the CPA that has the strongest U.S. connection. The United States and the broader international community must focus on the reality that acquiescence to one of the Parties’ abrogation of a key CPA provision endangers the entire CPA and thus ensures no peace in Darfur. 2. Building a diplomatic team: The United States, with the appointment of a new Presidential Envoy for Sudan, Ambassador Richard Williamson, has a fresh opportunity to energetically pursue full implementation of the CPA, including the Abyei Protocol. Failure to do so will cripple his tenure from the start. But Ambassador Williamson cannot do the job alone. He needs two full-time deputies, one focusing on the CPA and the other on Darfur. These deputies must be supported with a small team of diplomats based in the field—consistent with the doctrine of transformational diplomacy articulated by Secretary of State Condoleezza Rice. 3. Imposing a cost: The United States should work within the U.N. Security Council to press for targeted sanctions against any Sudanese officials who obstruct implementation of the CPA—beginning with the Abyei Protocol—or the deployment of the U.N.-AU hybrid force in Darfur. Concurrently, the United States must also work with the European Union to coordinate pressures and to provide relevant information to the International Criminal Court as it builds further cases against those most responsible for destroying Darfur. Success will require sustained multilateral diplomacy with the full array of sticks and carrots backed by as many international actors as possible. 4. Creating a field presence: The United States, through the use of a mix of its capabilities, needs to have a regular and visible presence in Abyei, for both political and programmatic reasons. Ambassador Williamson should make a very early visit to Abyei. The U.S. Charge and other U.S. embassy and consulate officials should visit regularly to monitor developments and report in detail back to Washington to help create a comprehensive and timely understanding in Washington of Abyei’s complexities. 5. Engaging the Misseriya: The Misseriya Arab population of the area is locked into an economic and cultural embrace with the Ngok Dinka of Abyei, which the Abyei Protocol provides for and recognizes. In the interests of peace in Sudan, the United States and other donors should engage the Misseriya specifically to address their legitimate needs for development of adequate water and pasture resources. 6. Preparing for nationwide elections: The United States and other international partners should specifically focus on requirements for free and fair elections in Abyei in 2009 and in the referendum scheduled for 2011. A specific plan that takes into consideration the impact of President Bashir’s refusal to fulfill his responsibilities is needed. This involves the aforementioned sticks and carrots, and U.S. will to lead in pressing for their effective implementation. The issue of Abyei is currently Sudan’s weakest link in the Parties’ implementation of the historic Comprehensive Peace Agreement. No change on Abyei means failure. Failure to adequately address Abyei is a virtual guarantee of horrific violence in that embattled region and may presage a full-scale war throughout the country. There remains time to remedy the situation, however. U.S. leadership is key. The United States helped lead the negotiations that produced the CPA, and in particular the Abyei portion of the agreement. The United States must now lead multilateral diplomatic efforts to break the impasse over Abyei which threatens the CPA, as well as a potential peace in Darfur. It is a legacy issue for President Bush, and a life or death issue for the people of Sudan. See Roger Winter and John Prendergast, “An All-Sudan Solution: Linking Darfur and the South,” ENOUGH Strategy Paper #9, November 2007. Available at www.enoughproject.org/files/reports/allsudan_20071114.pdf. See ENOUGH’s first report on Sudan, “The Answer to Darfur: How to Resolve the World’s Hottest War,” March 2007, at the ENOUGH website. “Sudan: Breaking the Abyei Deadlock,” International Crisis Group Africa Briefing No.47, October 12, 2007. The process and procedure used by the Commission is explained in detail in an excellent article entitled “The Abyei Protocol Demystified” by Douglas H. Johnson, one of the ABC’s international experts, which can be accessed at http://www.sudantribune.com/spip.php?article25125. Many Janjaweed have been integrated into the PDF as part of Khartoum’s strategy to “hide” its proxy militias within more formal security structures. The SPLA, or Sudan People’s Liberation Army, is the military wing of the Sudan People’s Liberation Movement. See Roger Winter and John Prendergast, “Democracy: A Key to Peace in Sudan,” ENOUGH Strategy Briefing #10, November 2007. Available at http://enoughproject.org/node/577.